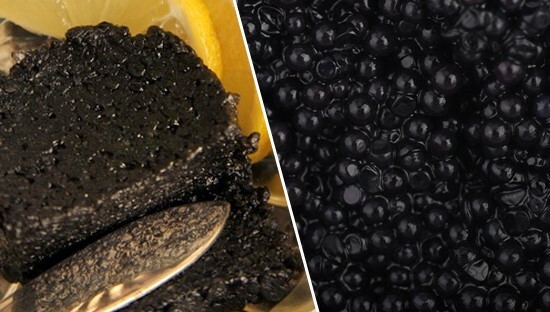 For making the granular caviar only mature caviar is used: the eggs are strong, elastic, have homogeneous size and color, they easily remove from the connective tissue and each other. The pressed caviar is made of fresh sturgeon species caviar. It is made with tussocky way of salting, then it is been slightly pressed which makes it homogeneous. Foreign flavor or discrediting smell are not allowed. This caviar looks homogeneous, dark color, nice flavor, slightly salted which is typical for the pressed caviar, with light bitterness. The unscreened roe is salted without peeling the hard roe. The unscreened roe is made of immature fat roes or roes with the very weak granules, without separating granules from the connective tissue. In all methods the amount of salt is allowed from 3 to 5%. «Sturgeon granular roe non-pasteurized» is a caviar with minimum of processing – just salting, it has a light aroma, delicate consistence and splendid bouquet of taste. Expiration date and storage conditions vary from 2,5 to 6 months depending on if the additional preservative was used except the salt, or any other food additive. «Sturgeon granular roe pasteurized» in addition to salting is also being heat-treated (pasteurized) which allows to prolong the expiration date greatly, at the same time preserving its unsurpassed quality. Pasteurized caviar expiration date is 8 months according to business standard SF 37490266-001:2011 and 12 months according to ТУ 9264-001-53815423-09. Both in pasteurized and non-pasteurized caviar the amount of salt is allowed from 3 to 5%. It is fairly often believed that the caviar cannot do without preservatives and it is almost the only one option to preserve the caviar. This assertion is falsely. In the middle of the last century they learned to pasteurize the caviar, i.e. warm up the product at moderate temperature. Pasteurization does not change the product properties essentially but it is enough for elimination of bacteria. Besides, the modern packing technologies give the opportunity to vacuumize the caviar which allows to preserve even non-pasteurized caviar during several months. The period and storage conditions vary depending on whether preservative was or was not used, and if it was then which one of them. For example, non-pasteurized caviar without preservative is stored from 2 to 4°С during 2,5 months; while non-pasteurized caviar but with preservatives is stored from 0 to +6°С during 6 months.